Not to worry, though, for there is already an unofficial alternative for Microsoft’s mobile platform. 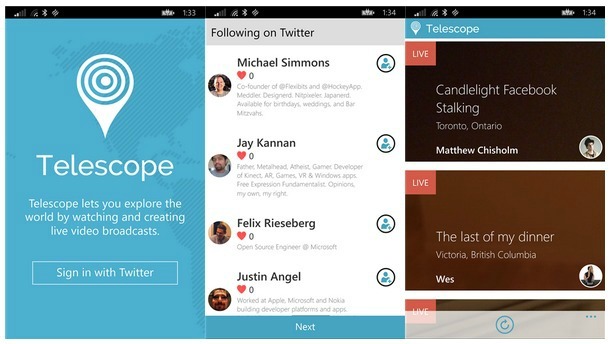 Telescope for Periscope has been created by a developer who was eager to use Twitter’s new service on Windows Phone. You can download Telescope from the Windows Phone app store, but know that it is fairly limited for now (that could be considered normal, however, since Periscope itself is hardly 24 hours old at this point). Currently, the app lets you sign up for Periscope (using your Twitter credentials of course), follow users, as well as watch broadcasts. That last one is pretty important, but perhaps more so is the ability to actually create your own live streams. That isn’t possible yet in Telescope, but the developer is working on it. Alongside that function, in the future the app should also allow you to look up users, edit your settings, view your profile, and send hearts and messages. You should be aware that since this is an unofficial app Twitter may decide to do things to impede its functioning, or even ban it from accessing Periscope. Hopefully the company won’t actually do any of that, especially since it doesn’t look like it has any plans to bring an official Periscope app to Windows Phone.